"This composting toilet is not only a great way to recycle waste products, but it is the cleanest composting toilet we’ve used. Our facility is on a city park and is heavily used, yet it never smells and requires very little maintenance. 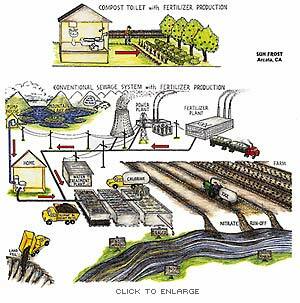 It is a great way to close the waste production to fertilization loop." The Human Humus Machine produces high quality humus, which has the same appearance and aroma as high-quality topsoil. Heat-generating and pathogen-consuming microbes control pathogens in the finished compost. The Human Humus Machine is available in a relatively low-cost kit form. The kit consists of all the parts necessary to convert two 55-gallon drums into a state-of-the-art composting toilet. The drums have a plastic liner to eliminate rusting. The kits are easy to assemble and can be completed in less than 2 hours. The installer would obtain the drums locally. We can also offer fully assembled units. The Human Humus Machine is a batch-type CT. After the drum is full, the contents of the drum are allowed to sit for a number of months to complete the composting process. In non-batch type composters, newly deposited material can contaminate compost ready to be removed. “there were more than 20,000 days of closings and advisories in 2005, at ocean, bay and Great Lakes beaches.” The bulk of these closings are the result of improperly operating sewage treatment plants and septic systems. The EPA estimates that each year, one billion gallons of raw sewage are dumped into U.S. waters. That is 3000 gallons for each person in the United States. 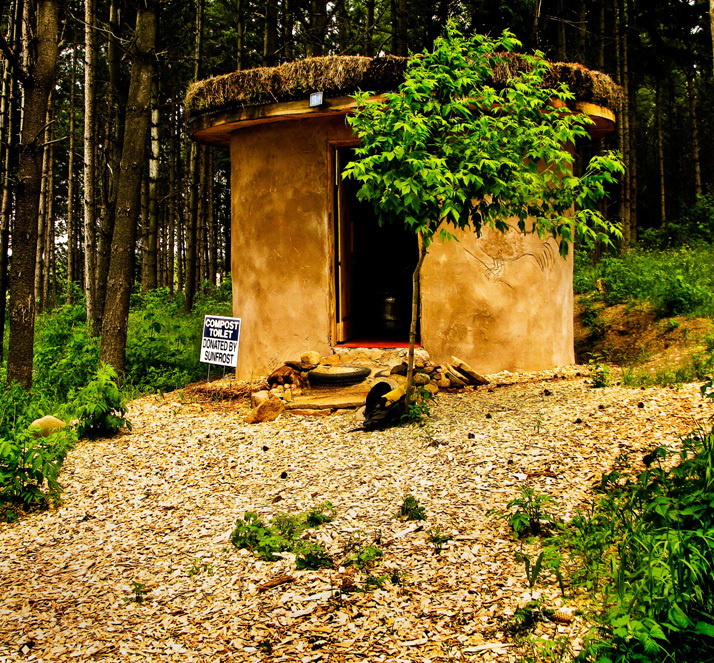 Composting toilets could conserve water and change this hazard into a valuable resource. A unique feature of the Human Humus Machine is that the compost can be pasteurized before it is removed from the composter. The temperature needed to attain pasteurization depends on how long that temperature is maintained; pasteurization can be accomplished at 130°F for 3 days or at 180°F for 10 minutes. When the composter is filled and about 10 pounds of easily compostable material such as unbleached flour, cottonseed, or alfalfa meal are added, temperatures high enough for pasteurization can be obtained. Even without pasteurization, we found that the level of E. coli in the compost was low enough to allow its use as a soil amendment. The EPA has developed standards for acceptable levels in sewage sludge. Sludge is the solid material settled out in a sewage processing plant. The un-pasteurized compost we tested had an E. coli levels five times lower than the standard set by the EPA for use as a soil amendment. To be extra cautious, we recommend that the finished compost not be used on crops that are uncooked or are in direct contact with the soil. in Wisconsin housing a Human Humus Machine. The Human Humus Machine is designed to provide optimum composting conditions: a warm environment with good aeration and moisture control. The Human Humus Machine is one of the few composting toilets in domestic use that is insulated and can attain temperatures significantly above ambient temperature. The center of the compost pile is typically about 50° above the ambient temperature. If the composting chamber is kept warm, the capacity of the composting toilet is significantly increased because the composting process is faster. Very large composting toilets typically do not heat up because of the large surface area of the uninsulated outside shell. The grate in the bottom of the composting chamber allows liquid to drain to the bottom of the composter. This liquid is incorporated into the compost pile by adding dry material to the composter, such as dry grass or wood shavings, and them pumping the liquid to the top of the pile. The composters are typically filled after about 1400 uses. The composting toilet incorporates either an AC or DC fan.. The DC fan can be connected to a battery or directly to a solar panel. The fan typically requires 4 watts to operate. The exhaust fan provides a constant flow of air so that odors generated while using the toilet or during the composting process are directly exhausted outside. The composter incorporates a 4-inch exhaust tube, which can be connected to 4” dryer vent fittings. It is amazing how odor free the composting material can be kept. 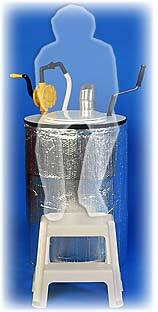 The Human Humus machine incorporates a highly efficient and easy-to-use stainless steel mixer. Each time the composting toilet is used, instead of flushing, the mixer is rotated several times and the newly deposited contents are buried in the soil-like material in the composter. The mixer is conveniently stored inside the composting toilet. A step stool is provided to so that the seat is at a convenient height. An alternative would be to build the composting toilet so that the floor of the restroom is about 18” above the bottom of the drums. In response to the two articles on recycling Bio-Solids in the October 2007 issue, I would like to emphasize the importance of recycling nutrients in sustainable agriculture and make a case for using human manure. The quantity of minerals and nitrogen in the body of a fully grown adult is fairly constant. This means that the amount of these nutrients consumed is equal to the amount expelled as human manure. If a fruit or vegetable is ingested, the quantity of nutrients contained in that food will be the same as those present in the human waste. Complete recycling of these nutrients could provide all the needed inputs to re-grow the crop. There would be no need for additional fertilizer. In engineering terms this method of analysis would be called continuity—what goes in equals what goes out plus what is collected. For animals grown for meat or dairy, what is collected (turned into edible animal protein) is typically about 10% of what goes in. In other words, 90% of the minerals and nitrogen in feed consumed by animals ends up in the manure. In the US we obtain roughly 2/3 of our protein from animal sources. Assuming a 10% conversion efficiency of vegetable to animal protein, the continuity equation tells us that the quantity of animal manure produced will be 6 times greater then the production of human manure. In the US only a very small percentage of animal manure is recycled. Separating livestock from feed production by many miles limits the possibility of recycling. Much of this manure then ends up as a pollutant. The fact that the amount of nitrogen flowing down the Mississippi River from various sources is equal to the quantity of nitrogen contained in the manure of the entire US population is a measure of how inefficiently we use these nutrients. It is as if we’re all using the Mississippi as a toilet. A question often asked is there enough manure to grow the countries crops with out chemical fertilizers. Using this type of analysis it is easy to see if all the manure, animal and human were recycled with 100% efficiency there would be enough manure to grow our crops. Minerals can be recycled with near 100% efficiency however it is more difficult to recycle nitrogen efficiently. This is an area which deserves more study. Although human manure is only about 16% of the total manure production, recycling is still important for conserving resources and managing pollution. If sludge is recycled during sewage treatment it contains only the solid portion of human waste. The liquid component, urine, contains 85% of the nitrogen, 90% of the potassium, and 60% of the phosphorus. Recycling only the solids retains a small percent of these nutrients. It would be much simpler and safer to recycle the liquid and solid component of human waste if it were not combined with gray water, industrial waste, and street runoff as is typical. The nutrients in human waste often turn into pollutants. In 2006 there were 25,000 beach closings and health advisory days because these nutrients were not properly processed and recycled. Most spills occur in storms when sewage plants are overwhelmed and raw sewage must be released into waterways. An alternative to recycling at the sewage treatment plant is the composting toilet. A composting toilet will recycle almost all mineral nutrients with nearly 100% efficiency. There will, however, be some loss of nitrogen. The quantity lost will depend on how the manure is composted. If done properly, pathogens can be effectively controlled. We have been building composting toilets for a number of years. Repeated tests have found the compost to be safe for use as a fertilizer. As an extra measure of safety, the compost could be used on plants that are not consumed raw and that are not grown at ground level. As a first step in initiating this recycling process, a CSA could provide food scrap composters and composting toilets for the customers’ homes. The composted material could then be returned to the CSA, closing the loop. The returned compost could be added to a larger compost pile where pasteurization temperature is attained. Hygiene considerations and transportation costs make it much safer and more efficient to transport composted rather than raw materials. We put together the accompanying diagram to illustrate the relative sense and senselessness of using composting toilets and conventional sewage treatment. Recycling nutrients is an important aspect of sustainable agriculture that has been overlooked. We are gradually using up our pristine sources of mineral nutrients. In the future these nutrients will contain more heavy metals as the purer supplies are consumed.